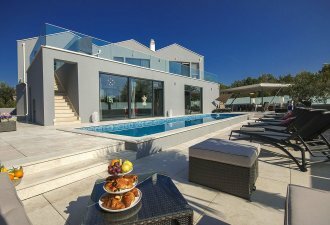 Villa Blanca is a newly built luxurious villa located at the outskirts of the small place Kastelir with a lovely panoramic view on the olive fields and the sea. The villa is located at approx. 12 km from Porec and Novigrad and their beaches. Only 3-4 minutes walk from the house there is a very good restaurant, grocery shop and a wine cellar which offers excellent Istrian wines and olive oils. The house was built and furnished in 2018. It is fully air-conditioned and equipped with attractive furniture. At the guest's disposal there are an outdoor swimming pool of 32 sqm, covered terrace with seating set, fireplace barbecue, enclosed garden with a well maintained garden and lawn of approximately 800 sqm and a private parking for 2 cars. Villa for 6 persons with a total living area of 150 sqm, situated on two fully air-conditioned floors. It consists of a ground floor with a cozy living room, fireplace and large windows with an exit to the terrace and a swimming pool. There is also a fully equipped kitchen with a dining table for 6 persons, one double bedroom with a double bed, private shower/toilet and one separate toilet. On the first floor there are two double bedrooms with SAT-TV, private shower/toilet, both with a double bed and shared terrace with panoramic sea view. NOTE: THE HOUSE IS SUITABLE FOR ADULTS AND FAMILIES WITH CHILDREN OVER 6 YEARS OF AGE.